Wynn Baxter returns to Willow Island to study rare plant life and welcomes the opportunity to investigate the mysterious circumstances of her father’s death. But the truth gets complicated as twenty year-old memories begin to surface. What Wynn learns will shake her emotional foundation. A haunting story of forgiveness, science, murder, and other matters of living. Wynn Baxter considered life a series of birthday presents. Some she grew out of like a pair of jeans, or purple hair. Some presents came wrapped in paper, but once the paper was removed, she’d know in a glance if she loved it or hated it. The very worst gifts came unexpectedly and stuck around for a lifetime, such as the memory of her father lying in his casket on her sixth birthday, and her mother taking off. Her mother, Ruth, suddenly developed an inexplicable burden for the Pygmies of the Ituri Forest in Central Africa. Who knew? Certainly not Wynn. Not Grammy or Gramps, either. Not even her mother’s twin sister, Roxie. But her mom was gone and quickly dubbed as the black sheep of the family. After that, Wynn was referred to as the lost lamb. Wynn smiled. It was early morning, plenty of time for birding. Her backpack was fully equipped, packed with binoculars, cameras, and the basics for fieldwork. She added a logbook and electronic tablet from the desk, cradling it between the soft pads in the pack, and then drew one of the arm straps over her left shoulder. Outside, she walked down the tree-shaded path to her Aunt Roxie’s cottage. A flicker of wings caught her attention. A Kirtland’s warbler darted back into the island’s foliage. Wynn cupped hands over her eyes, but she didn’t see the bird now. As soon as she could make an entry into her Life List she’d note its sighting. Just ahead was her destination, a blue clapboard cottage trimmed with white shutters and heart cutouts. Wynn zigzagged across the yard to keep from bumping her head into all the birdhouses hanging from tree limbs. People talking rolled from one end of the porch to the other. Through the wavy, old glass she saw that Aunt Roxie’s Bible Club was in session. Wynn had assumed the club would meet later in the day. What should she do? She’d simply go birding alone. “I don’t know how to play bridge, but I sure know how to eat. I’ve come at the right time.” Wynn took a long sip. The women chuckled and nudged each other as though they shared some private joke; what had Roxie told them about her? “We don’t actually play bridge, my dear. Our official name is Bridge Over Troubled Waters Ladies Club. Quite a mouthful, I know. You see, God is our bridge and the troubled waters are life. And here we are…the ladies!” Roxie curtseyed. “Ahhh. I see.” Wynn smiled at them. “How are you enjoying your time here on the island, Wynn?” A blonde woman asked just as her cell phone played. “Sorry…I have to answer this call.” Turning her back she flitted to the far end of the porch. “Ladies, although I’m overjoyed to have my niece with me, Wynn’s real purpose here is to study plant life. She has no time for socializing, at all. But before she leafs in the fall, I’m hoping she’ll cure my rose’s mold problem. Get it? Before she leafs in the fall?” Roxie chortled. “God blessed my twin sister with a smart child, didn’t He?” Smiling broadly, Roxie kissed the top of her niece’s head. “Sheri,” Wynn interrupted with a smile. Wynn pointed at the nametag pinned to her blouse. “Sheri Mills runs one of the island’s most popular tourist shops,” Roxie said. “Hard to miss,” Wynn said, remembering the building. “Wynn, it’s such a blessing to meet you. I’m Faith. Here, try one of my éclairs.” The cell-phone lady had ended her call and now held out a platter. “Faith Montgomery bakes heavenly desserts when she isn’t selling real-estate,” said a large woman in a flowered caftan. “I give all the glory to God. And praise the Lord, these days, real-estate is sizzling on the island. Tourist money just keeps rolling in on the waves.” Faith’s cell rang again. “See what I mean? Pass these out for me, will you, Wynn?” Faith handed the platter to Wynn as she answered the cell. Her voice faded as she walked away. Steadying the platter with one hand, Wynn set her éclair back on her plate and began serving the women. “It’s nice to meet you.” Wynn smiled. “When is Boone due back from his business trip to…where did you say he was?” Sheri asked Jackie. Wynn handed the empty tray to Roxie and returned to finish her éclair, but it was gone. “I think you’ve met everyone except for Wilda.” Roxie referred to the woman in a flowing caftan, who was busily devouring both her dessert and Wynn’s. “Isn’t that my éclair?” Wynn pointed. “Of course it is. 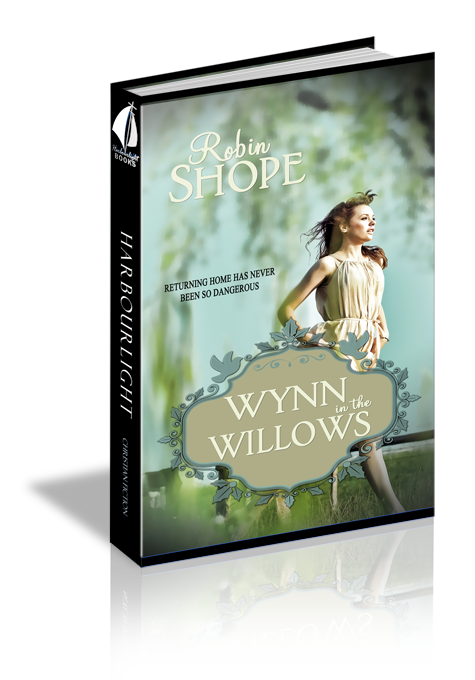 Owl always finishes what we leave behind,” Roxie whispered to Wynn in an informative tone. Wynn rubbed her temples against a migraine. The unexpected calling of a nearby loon eased the pain. Now if she could just see the bird. Dare she go for the binoculars inside her backpack? As if sensing her discontent, Roxie scooted her chair closer to Wynn, and patted her hand to get her attention. “I bet this is a fascinating story. Tell me every detail,” Wynn prodded, hoping to please Roxie. “I will.” Owl began, “In the late 1800’s my ancestors, Joseph and Anna Reed, bought the string of Willow Islands and built a mansion on the south end of this one. It was real fancy, no doubt about it. Italian plasterers did the first floor walls. Not only were there European imported marble fireplaces, but also marble windowsills a foot wide. Anna wouldn’t have any but the very best wallpaper for the second floor, and every piece of furniture was handmade to her specifications. It took four years to build the manor, and six months more just to ferry over all their furnishings from Egg Harbor. Nonchalantly, Roxie reached out and pinched a flap of skin on Owl’s arm. “There was a crumb on your arm I was trying to brush away. Sorry Owl.” Roxie excused herself and left the room. Wynn wondered what had just happened. Had Roxie warned Owl in some way to keep her from continuing the story? “A curse?” Wynn asked, intrigued. Maybe this quiet island had some mystery, after all.